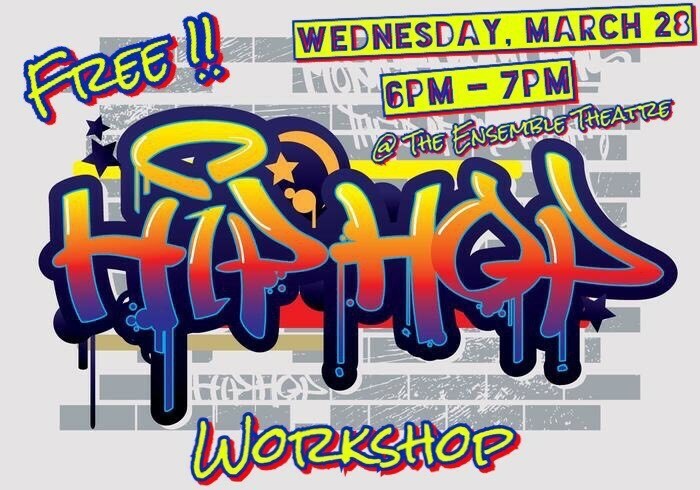 The Ensemble Theatre is hosting a FREE hip-hop workshop tomorrow, Wednesday, March 28th at 6pm taught by Kathryn Ervin! Come dressed to move, learn, and have fun! Please RSVP by emailing “hip hop” along with your name to kbrown@ensemblehouston.com. Bring a friend! Kathryn Ervin is a professor in the Department of Theatre Arts at CSUSB. She teaches courses in Directing, Acting, Creative Drama and African American Theatre and Film and Culture. A graduate of Wayne State University and Illinois State University, she is active in numerous professional organizations. She is currently the board chair for The Arts Connection, The Art Council for San Bernardino County. She is a consultant and past president for the Black Theatre Network. In 2017 she received the Kennedy Center Region VIII Gold Medallion recognizing commitment to the goals and values of the KCACTF and educational theatre. Her recent productions include The Arabian Nights, Once On This Island, Ma Rainey’s Black Bottom, Keep Hedz Ringin’, and Intimate Apparel.